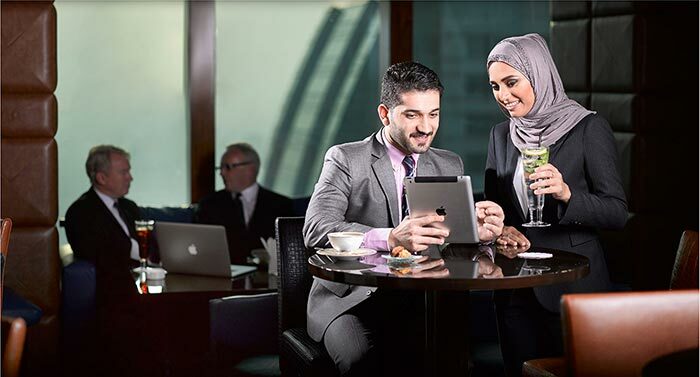 Join the vibrant 24 hour business community located in the heart of Manama. The Bahrain Financial Harbour Masterplan. 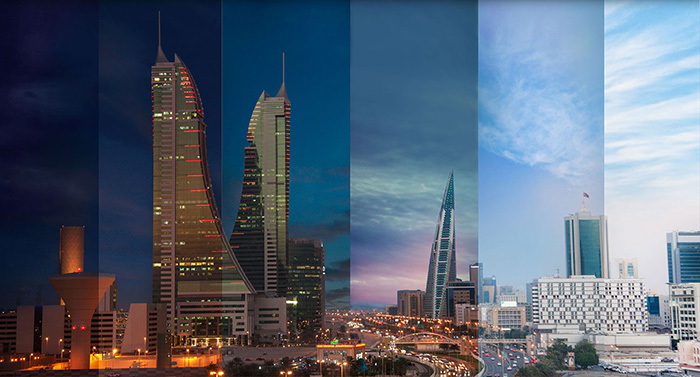 Bahrain Financial Harbour Holding Company B.S.C. reclaimed 38 hectares of land in a prime location opposite the commercial heart of Bab al Bahrain located on the northern shore of Manama, Kingdom of Bahrain. This development was named the Bahrain Financial Harbour Masterplan. Within this Masterplan, regions were allocated different uses, comprising of residential, leisure, hospitality, public spaces, roads and commercial. The Financial Center Development Company B.S.C. developed the iconic 52-story building consisting of The Harbour Towers - East and West, plus Harbour Gate the gateway to this commercial center at the heart of the Bahrain Financial Harbour Masterplan. 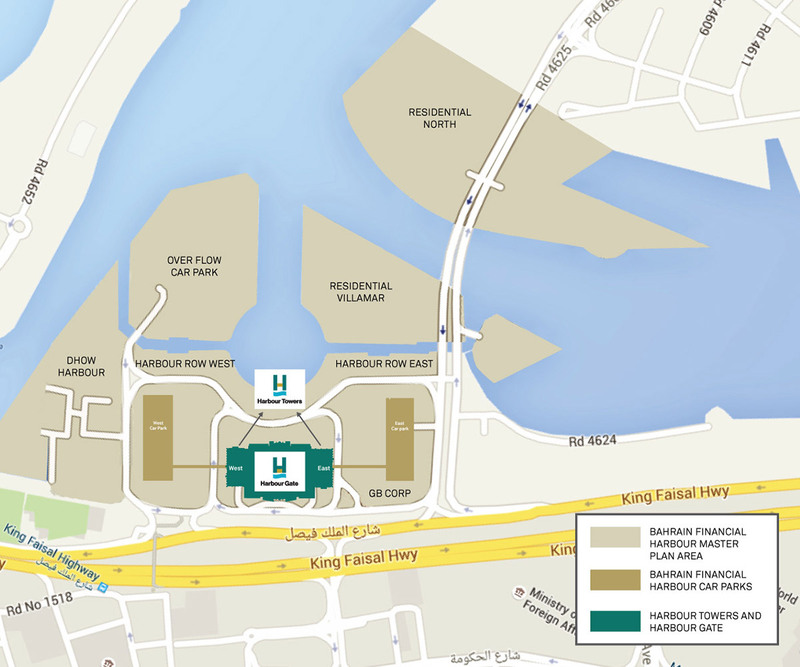 The Harbour Towers and Harbour Gate have grown to become the commercial hub of Bahrain Financial Harbour. Bahrain’s number one business address. The Harbour Towers - East and West and Harbour Gate form the commercial centre at the heart of Bahrain Financial Harbour. Collectively they are the most prestigious business address in the Kingdom and the two office towers are visible from almost every point in Manama. A business address that speaks volumes about your company. 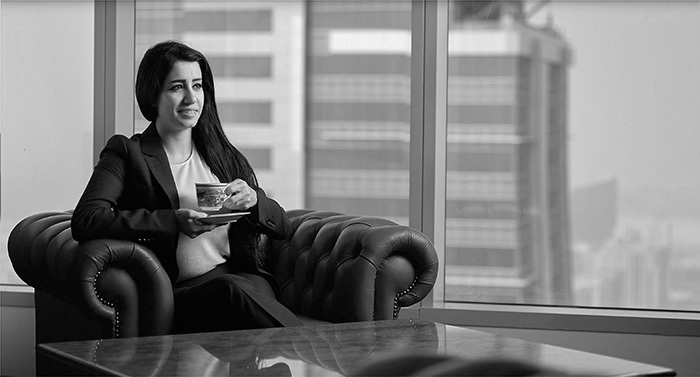 Arguably the most prestigious address in the Kingdom of Bahrain and one of Bahrain’s landmark buildings offering world class Grade A office space. The Harbour Towers were designed specifically to meet the exacting needs of financial services firms as well as blue-chip commercial companies. Incorporated in the scheme is dedicated visitor parking along with allocated tenant parking, a Helipad, plus visitor drop off areas to each of the Harbour Towers. The 52 storey East and West Towers offer occupants impressive 360° views over the capital. The Capital Club is an exclusive private members club on 51st and 52nd floor of East Tower, offering members fine dining and relaxed club lounges for networking and entertainment. When the temperature rises, covered parking is a real comfort. 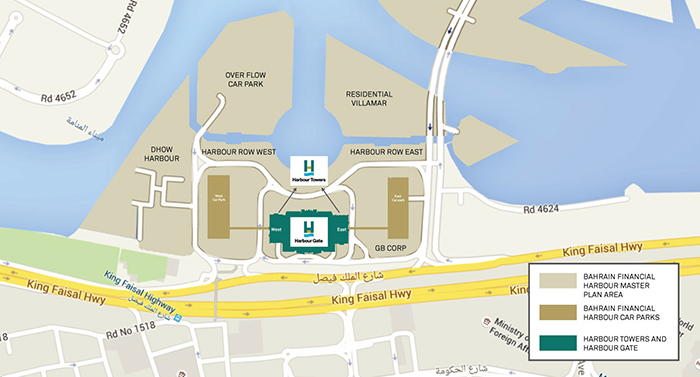 In the heat of the Gulf Peninsula, easily accessible covered car parking near to your office is a necessity. The Harbour does not disappoint. The East Car Park is accessed via air-conditioned walkways from the Harbour Towers which connect with the Harbour Gate. There are 3,114 car parking spaces in total currently available at the Harbour (1,717 car spaces in the East Car Park, 531 ground surface parking spaces, 866 car spaces within the Harbour Gate) 1,250 additional car spaces will be provided on completion of the West Car Park due in 2016. There are 275 dedicated visitors car spaces provided on the Basement and Ground floors of the Harbour Gate. From the moment you set foot inside the building you know you’ve “arrived”. 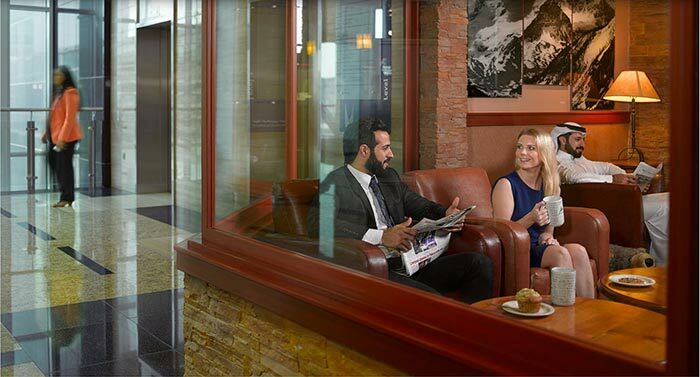 Harbour Towers have been designed to impress, from the double height ground floor reception area and 24 high-speed lifts incorporating sequence controls designed to cut waiting time. Security is key, with access control systems throughout the two office towers and full CCTV system with 600 cameras throughout the property for high-level security. Floor layouts are designed with flexibility and efficient space utilization in mind and a centralised Building Management System controls HVAC and electrical supplies throughout, with a UPS system including back-up electrical generator guaranteeing continuous power supply. Below ground, there is a dedicated basement service area, loading bay and service / fireman lifts serving all office floors within both Harbour Towers and all floors of Harbour Gate. Throughout the building there is state of the art ICT provision including satellite TV and fiber optic cabling. Periodic training and fire drills for building evacuation is provided. Plus a dedicated helpdesk telephone line for all management and maintenance issues, on hand at all times. Talk to us. Our policy is to be flexible we will make space for your needs. Harbour Towers has a wide range of office suites available for lease on competitive terms ranging from 50 sqm up to 1,800 sqm on a single floor. The floor layout plans enable efficient space utilisation without deep plan space. Prospective tenants can choose from fitted or un-fitted space. Also, there are a number of service office operators in Harbour Towers who can provide smaller suites on more flexible lease terms as well as a full range of business centre services. Located between and connecting both of the Harbour Towers is Harbour Gate which is the main thoroughfare and the Harbour’s focal point. Here you will find coffee shops, restaurants, convenience store, a variety of business support uses, etc as well as the Bahrain Bourse. Recently Bahrain’s MOICT decided to amalgamate all of their operations, including the Bahrain Investors’ Centre, under one roof at Harbour Gate. 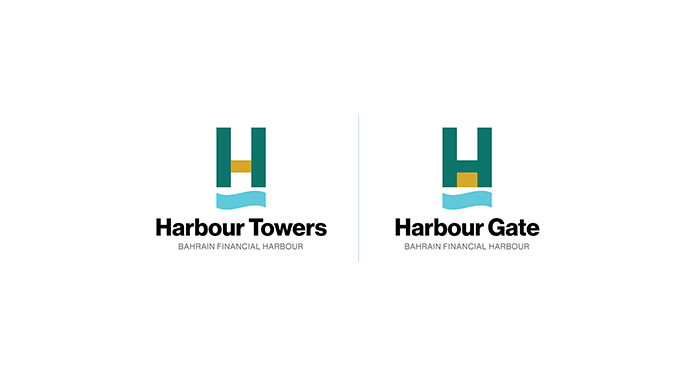 Harbour Gate will then be Bahrain’s business gateway for setting up new businesses and company registration/renewals. We aim to create a lively “village square” at the heart of Harbour Gate with cafes, coffee shops, business support uses, as well as a continual programme of cultural events and entertainment. The aim is to create a vibrant meeting place for both occupiers and visitors with easy access from King Faisal Highway and plentiful visitor car parking.